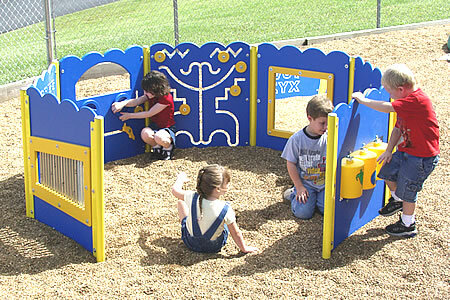 The Kiddie Korral offers 7 fun play panels , including a music panel, a mirror panel, and a steering panel. The Kiddie Korral is made from low density polyethylene, a tough, hard plastic that does not break or splinter. The posts are made from galvanized steel. This is a very durable and high quality product that is safe for kids to use even after years of use. It’s best for kids ages 2 to 5 years. Its dimensions are 10 feet wide by 10 across x 3.5 feet high. Weight: 611 lbs. just phone us TOLL FREE.